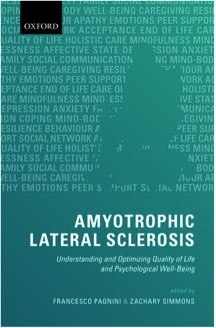 This book is unashamedly about the psychosocial aspects of amyotrophic lateral sclerosis (ALS), also known as motor neurone disease (MND), rather than the physical disease. The opening chapter is a review of the studies that have investigated psychological interventions for optimizing well-being in people with ALS and their caregivers — hypnosis, mindfulness, cognitive behavioral therapy (CBT), expressive disclosure therapy, and dignity therapy. There follow chapters on quality of life, psychological morbidity (depression, anxiety, and hopelessness), mindfulness and mindlessness, complementary medicine, genetic counselling, resilience and coping strategies, CBT, sexuality and intimacy, the usefulness of the Internet, assistive devices, wishes and values related to the end of life, physician-assisted suicide and euthanasia, psychological implications of bulbar dysfunction, caregiver quality of life and, finally, a discussion about the provision of care that is more holistic. I was interested in the comments about the Internet — that we are past the point of asking whether it is ‘good’ or ‘bad’ and it is up to society to use it productively; I applaud the productivity, but my experience with cancer patients raises concerns about safety. The chapter on physician-assisted dying provides a reasonably balanced discussion, including what has happened in the Low Countries: ‘[T]he European experience has been disconcerting.’ But the scale and range of abuse in The Netherlands is skimmed over, and words like ‘abuse’ or ‘murder’ (as I might use to describe a doctor performing euthanasia without request, never mind consent) have been carefully omitted. And I was not aware that the Supreme Court of Canada, in its deliberations, could see no difference between acts of omission and acts of commission. Francesco Pagnini is a psychologist and assistant professor at the Catholic University of the Sacred Heart in Milan, and Zachary Simmons is a neurologist and professor at Penn State Hershey Medical Center in the U.S. There are 17 chapters written by a total of 33 contributors from the United States, United Kingdom, and Europe. The text appears well-referenced and there is an index. I was impressed with this book. If you work with ALS patients, this is required reading. For others who work in palliative care, listening to how to best address the psychosocial aspects of what most regard as a clinically difficult condition may enable you to better manage similar issues in other patients who cross your path. Christie Watson sounds as though she was a bit of a rebellious teenager. She left school at the age of 16 and went into mental health nursing. Her first clinical experience was in a locked psychiatric ward at the age of 17. Then she changes course a bit and completes her training in pediatric nursing. Her first job as a graduate was on Pumpkin Ward, a pediatric neurosurgical unit; I definitely thought it was going in at the deep end. But she had an excellent mentor who she says taught her how to be a nurse. Eventually, she finds her calling in the ICU, working in both neonatal and pediatric units. Watson comes over as thoughtful and honest. She makes a point of the gulf between what academic theorists say and those actually doing the nursing. And if she feels there is a credibility gap between what happens (or should happen) in the real world and the sanitized professional edicts from the Nursing and Midwifery Council, she says so. She discusses burnout, or workplace stress, which she says is both common and serious. She also discusses compassion fatigue, which she associates most with those who manage trauma; my experience is that compassion fatigue is a significant problem in both medical oncology and palliative care. 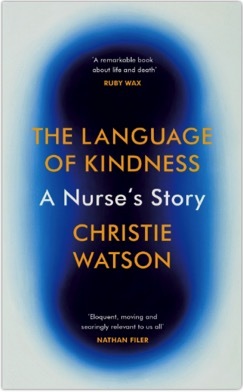 But Watson admits that it took being on the other side of the fence (and near the end of her nursing career) — observing the nurses involved with her father as he died of lung cancer — to really understand the importance of kindness. This is one nurse’s story, warts and all, of what nursing is really all about. It pulls no punches; there is no airbrushing or hiding behind political correctness here. Added to which it is well written and a pleasure to read. I would warmly recommend this book to anyone who works in palliative care, especially the nurses. This exploration of what is the essence of nursing should be of interest to any nurse, and is close to the heart of what we call palliative care; in addition, some of Watson’s little patients do not survive, and she is not backward in talking about death and dying. So, how hard is it for a nurse to be kind, compassionate, and caring in all circumstances? In the introduction, Silbermann declares, ‘Palliative care is personalized care…based on three pillars: treatment goals, symptom management, and support of the caregiver.’ And this remarkable book is the story of how palliative care is developing in places around the world, rich and poor, among those of whatever race, colour, culture, or religion. On the one hand, it is a celebration of the achievements of palliative care and, on the other, a reminder of how far we have to go. Some contributions, notably those from the U.K. and Australia, provide an overview of national development. Others are focused on particular practices or particular patient groups, such as total parenteral nutrition (TPN) in cancer supportive care or the management of patients with severe mental illness. Daniela Mosoiu continues the story of Hospice Casa Sperantei and shows how difficult it is to progress palliative care in places like Romania. There is a Spanish study of the quality of life of palliative care professionals, and another on the development of pediatric palliative care in Buenos Aires, where the need for such services is not endorsed by public health policy. 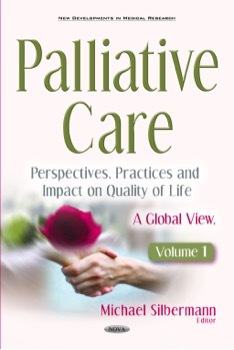 There are 36 chapters reflecting the development of palliative care services both in the developed and the developing world, across all cultures and age groups. Areas covered include the Americas and Europe, a dozen snapshots from Africa and the Middle East, and stories from troubled places like Iraq and Afghanistan. India and China follow and, finally, Australia and New Zealand. Professor Michael Silbermann originally trained in maxillo-facial surgery and was a professor at Technion (Israel Institute of Technology) in Haifa. Since 1996, he has been the Executive Director of the Middle East Cancer Consortium, an organization promoting collaboration and the development of services, including palliative care, across the region. I enjoyed this book. Here is a snapshot of the development of palliative care around the world, written by the people who are doing it. But we are urged not to rest. ‘This book calls for the global health community to urgently respond and bring around a rapid change in a totally unjustified situation that still prevails in over three-quarters of the world.’ I thought the standard of the contributions was good, although in a few places I longed for an editor with a sharp pencil, as several chapters were long to the point of being tedious. Anybody who works in palliative care will enjoy the stories in this book, but I have to say I thought it a bit expensive. Jahnna Beecham is an author who has also worked as an editor for National Geographic. Katie Ortlip first trained as a nurse, following which she did a bachelor’s degree in psychology and a master’s in social work. She has worked for Asante Hospice in Oregon for the last 25 years. This is a straightforward, easy-to-use, easy-to-understand guide to caregiving, humorously described as a sort of Death for Dummies guidebook. It is divided into four sections. The first, ‘Living With Dying,’ is about the journey: being with someone, hospice, and looking after yourself. ‘The Caregiver’s Manual’ provides useful and accessible information on all aspects of care, complemented with numerous illustrations demonstrating some of the physical aspects of the care. ‘The Journey’s End’ is about the process of dying: what you need to know, what you can do, and a chapter on how to go on living. The last section provides guides to things like Doc Talk, medications, the Pain Ladder, and online resources. I thought this book was set at about the right level for the average layperson who needs this information. It was very much to the point, rather than long and wordy, and I felt the information was well set out and accessible. It is very practical and includes instructions on ‘How to...’: have the conversation, navigate the emotional and spiritual journey, give the best care, control pain, address symptoms, work with hospice, care for yourself, get your loved one’s affairs in order, understand the dying process, and go on living after the loss. I was impressed. 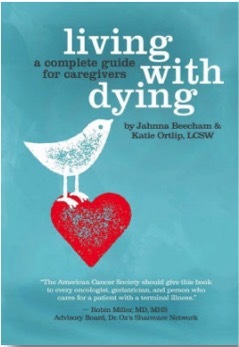 I think this book would be very helpful to anyone caring for a dying loved one. When you are dealing with caregivers who seem lost or are actively seeking information, you could consider recommending this book. Note: This book was previously published by Radcliffe Publishing in 2011. She provides a good discussion on most aspects of communication in palliative care, starting with how to go about a comprehensive and multidisciplinary assessment. There is a reasonable overview of (and how to talk about) surgery, radiation, hormonal treatment, and chemotherapy. However, there is no mention of the wave of tyrosine kinase inhibitors and monoclonal antibodies that have arrived over the last few years. She discusses communication at various stages: at diagnosis, during treatment, when the patient and family feel the impact of serious illness, when talking about a poor prognosis, advance care planning, breaking bad news, and the dying phase. Finally, there is a chapter on how to respond to frequently asked (difficult) questions. The text is interspersed with innumerable illustrative case histories. 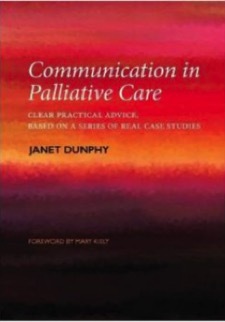 There are several books available offering to teach you the fundamentals of communication in palliative care, but this one stands out. Straightforward, there are no pages of theory here. It is eminently practical, born of years of experience, yet kind and caring. I would be happy to recommend this book to someone looking for a primer in palliative care communication, although I thought it was definitely on the expensive side. 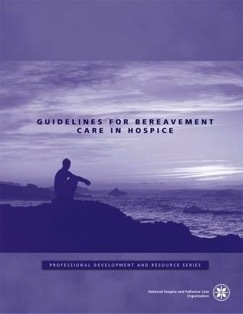 This is a collection of 37 topics to do with bereavement, arranged alphabetically: accountability, advocacy, assessment, availability, caseload, communication, community services, confidentiality, discharge, documentation, education, ethics, ethnicity, evaluation, interdisciplinary care, the Internet, plan of care, policies, quality assessment, referral, reimbursement, role definition, self-care, spirituality, supervision, team collaboration, trauma and disaster services, and volunteers. For each, there is a brief background, followed by the guidelines, together with applicable NHPCO Standards of Practice and any U.S. Medicare regulatory requirements. From what I could see, this was mostly organizational, administrative stuff rather than clinical care. If you work in the United States, this would be a useful manual to have, with all the material together in one place. I am not sure how much of it is available on the NHPCO website, and was unable to find out because anything to do with bereavement was locked away in the Members Only section. If you work outside the USA and are setting up a bereavement program, this manual would facilitate the creation of a comprehensive program. 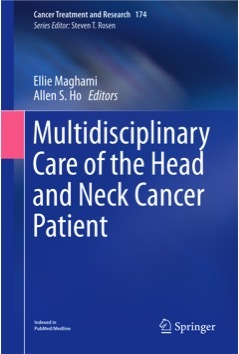 This book is an up-to-date review of the active treatment of head and neck cancer from the head and neck teams at City of Hope and Cedars-Sinai in California, USA. The good news about this book is that it provides good coverage of the surgery, radiation, and medical oncology involved, as well as chapters dealing with the role of other members of the multidisciplinary team: nurse practitioners, speech pathologists, dieticians, physiotherapists, occupational therapists, and medical social workers. The bad news, from my point of view, is that half the story is missing. The chapter on medical oncology includes sections on first and second options for metastatic disease, but the D-word is not mentioned. What about the patients with progressive and terminal disease? The figures for the U.S. (www.cancer.net) show estimates for 2017 of 64,000 new cases of head and neck cancer and 13,700 deaths. The figures for the U.K. (www.cancerresearchuk.org) show 12,000 new cases of head and neck cancer in 2015, and 10-year survival varying from 19% (hypopharyngeal tumors) to 59% (salivary gland tumors). That sounds like a lot of people who might benefit from palliative care or hospice care towards the end of their life. But I had to wait until the very end of the book before I found two pages (out of 282) that mentioned the D-word and end-of-life care, with a boxed summary of the CARES tool; interestingly, the words ‘hospice care’ and ‘palliative care’ do not appear. I salute the advances in active care and I salute the advances in multidisciplinary supportive care, but I do not like the idea that patients who develop progressive disease are no longer spoken about. I am moved to repeat the advice given to Elisha Waldman (see last month’s review of This Narrow Space: A Pediatric Oncologist, His Jewish, Muslim, and Christian Patients, and a Hospital in Jerusalem): ‘Never forget, if you accompany your patients only until the battle is lost and they are dying, if you abandon them at that point and leave them alone, you have done only part of your job, and not done it well. Your job is to accompany your patients until they are either better or safely on the other side.’ Again, amen to that! The lack of an index was an annoyance, as was the absence of any information about the contributors. It helps to know whether an author is a surgeon, a social worker, or something else. If you work in palliative care and see a lot of patients with head and neck cancer, this book will provide you with some pointers to symptom management (although they may not be easy to find). If you want a comprehensive discussion of multidisciplinary end-of-life care for patients with head and neck cancer, it’s not here. Your online shopping can help IAHPC!